Life gets busy for me sometimes. I work hard to create awesome recipes to share here at Savory Lotus. Working from home doing something I love is my dream and my vision. There is a lot that goes into running my own business. And I thank you all for your love and support. That being said, my family needs to eat every day as well. 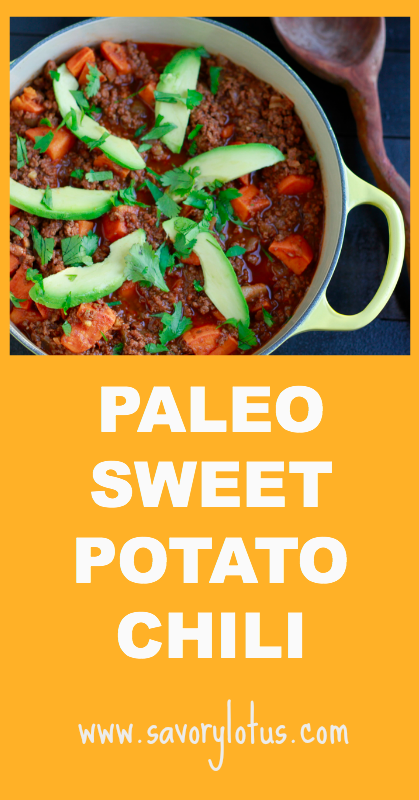 That’s when I bust out this super easy, deliciously hearty Paleo Sweet Potato Chili. Beans and me are not friends. I took me along time to finally say good bye to all beans and legumes as they just don’t agree with me. My belly is much happier since we made the change. I do, however, love me a nice bowl of warm chili. No worries, because you will never miss the beans in this savory, lightly spiced bowl of yumminess. 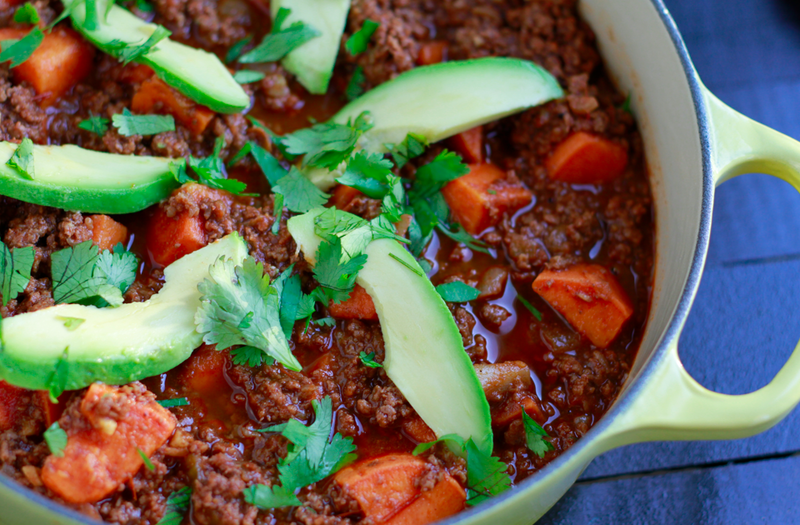 So next time you need a healthy, nutrient-dense meal to put on the table, go ahead and make yourself a pot of this sweet potato chili. I serve it with loads of avocado and cilantro over a bed of steamed greens. You will LOVE it! I’m so glad that you enjoyed it. Sounds so good with an egg on top! YUM! Just made this to take to a family (sooo glad it turned out yummy) and made some for us too. Thanks for the great flavor filled recipe. Looks so yummy! Do you think it would freeze well with the sweet potatoes? This was very, very tasty! Thanks! So glad that you liked it, Shannon! I’m on day 4 of my first Whole30 and I made this for dinner last night and LOVED it. I honestly think it’s the best chili I’ve ever made. I left out the celery and added zucchini, and carrots as well as a little tomato paste along with fire roasted diced tomatoes and lime juice. My husband, who is a chef, even said it was one of his favorites I’ve made. I’m having a hard time deciding if I want to eat the leftovers for breakfast today or lunch at work tomorrow. Thank you so much for this! I haven’t tried it but I bet it would be great in a slow cooker. I would brown the meat them add the rest. Let me know if you try it! 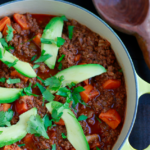 This Chili is AMAZING!!! It has become a household favorite and a frequent request! We love the leftovers too! The next morning it’s delicious with an over easy fried egg on top! Thank you for sharing!!!! Thanks for the sweet feedback! I need to try this with fried eggs next time. Sounds delish! do you think it would be as good if the sweet potatoes were puréed? Hubby hates sweet potatoes but if he doesn’t know they are there, he is fine with it. It would just have a different texture. You could do carrots or some other veggie instead. I am so glad my daughter (Alison) told me about your website. 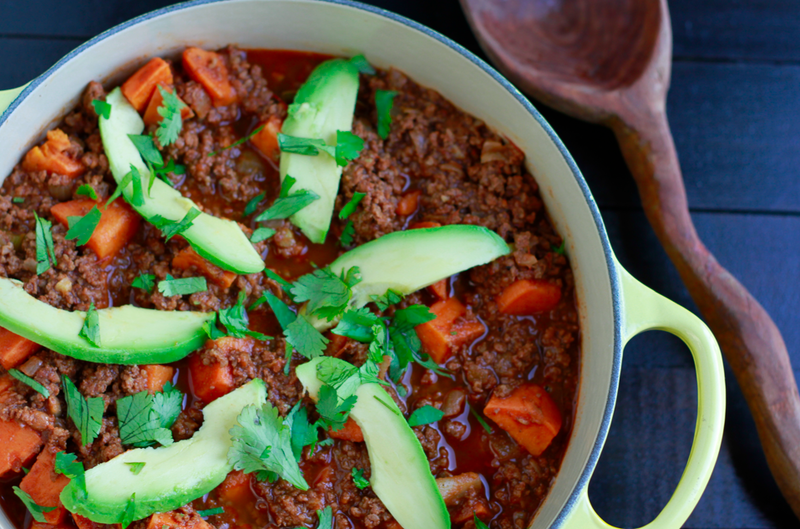 This chili is so amazing and I’m not a big chili fan. I will be trying so many more of your recipes (recently made the cauliflower with curry) that was delicious as well Thank You! YUM! Had this at a book club and then tried it myself (bison). Was fantastic and my husband’s new favorite chili. One note…I did have to simmer for a good hour and 20 minutes for the sweet potato to cook properly. They might have been just a bit over an inch..but not by much. In any case…thanks for the recipe! Lauren, I was just making this again tonight for dinner and decided to read the comments for fun! I was wondering if that was you since you mentioned bookclub! Anyway, I cut the sweet potatoes in much smaller cubes instead and it cooks a lot faster. Kids gobbled it up and it’s Whole30! Wahoo! 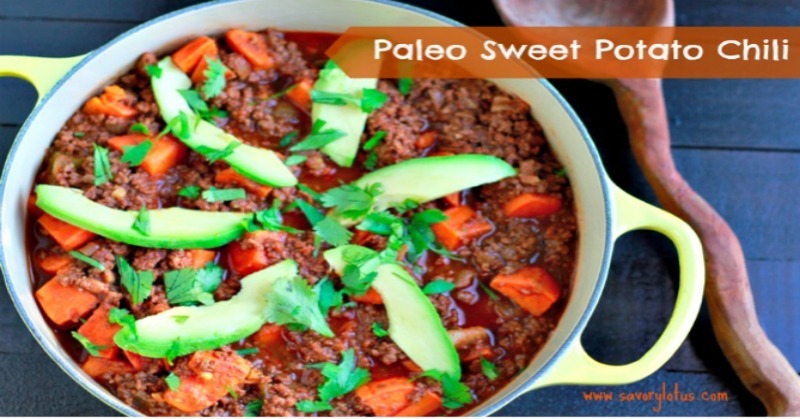 This recipe is AMAZING, especially for people just starting the PALEO lifestyle! It’s my go to in a pinch and I get to enjoy it for dinner and lunch the next day! I forgot the celery and didnt have any all spice or ginger and it still turned out awesome. Don’t let spices stop you if you dont have at first! Just made this for dinner and it’s absolutely outstanding. My sweet potatoes seemed too big but they cooked to perfection within 40 minutes. Will definitely make again. Thank you!